Adeea Rogers, better known as ‘The Trendy Socialite’, is the visionary behind the world renowned and highly anticipated International Natural Hair Meet-up Day. 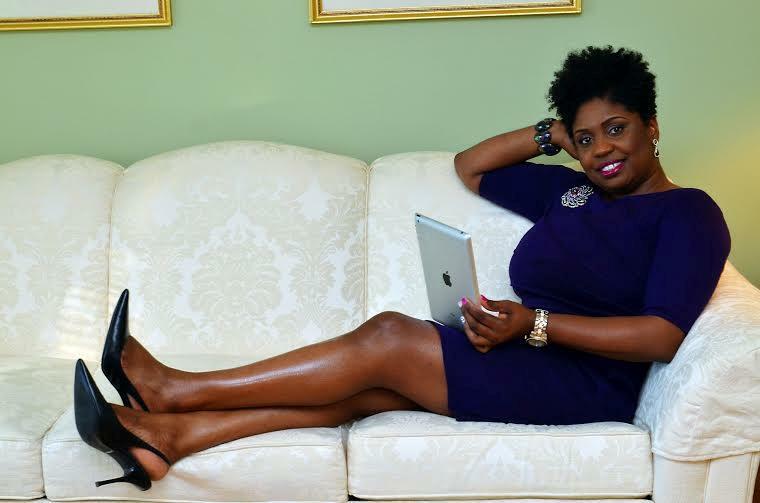 Adeea has been a corporate event planner for 14 years and has also managed to plan other exclusive events but INHMD is her biggest endeavor yet. She is currently employed at East Carolina University as the Assistant Director of Marketing for Student Involvement and Leadership. We had the pleasure of sitting down and speaking with Adeea as she shared a bit of her personal journey and provided some details on the wonderful things ahead for this year’s event. Adeea first got the idea for INHMD after attending the 2011 World Natural Hair Show held in Atlanta, Georgia. While there she stated being “over-whelmed, inspired and excited all at the same time.” Although she didn’t know much of anyone there, she shared how the atmosphere emitted a sense of familiarity that made the environment so welcoming. Upon leaving the hair show she took that feeling with her and decided that events like that need to happen in her area. Upon returning home she immediately got to work on providing that experience. She hosted her first couple events and began connecting with other natural hair organizers across the country. It was then she realized that many of them weren’t having the same experience like she had at the World Natural Hair Show. 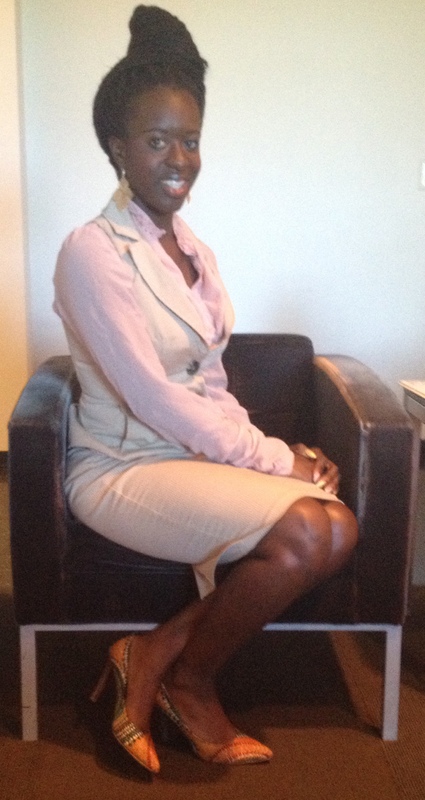 She also recognized that there were many emerging natural hair brands that needed more exposure within her community. So she thought “everyone has meet-ups all throughout the year but how impactful would it be as a community to have them all happening at the same time throughout various cities?” This idea is what birthed the International Natural Hair Day. International Natural Hair Meet-up Day (INHMD) is an annual one-day event where women from across the world come together to collaborate, connect and celebrate the beauty and versatility of natural hair. 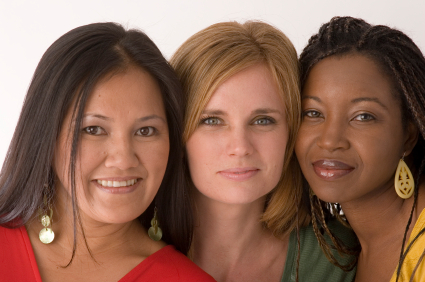 The INHMD platform was created to provide women —and men, with the opportunity to join together in solidarity to uplift one another through the exchange of information and networking. Communicating virtually through a variety of events held around the world, INHMD provides a unique experience for the entire natural hair community and any healthy skin or hair enthusiast to join in. This year’s events will take place worldwide in 60 US cities and 5 international destinations to include Paris, France; Amsterdam, Holland; Toronto, Canada; Tokyo, Japan and Saint George’s, Grenada. All events are happening on Saturday, May 17th , 2014 at separate times or simultaneously. Each city’s host will provide a select experience that they would like to bring to the community. Adeea has dedicated much of her time to teaching and training city hosts on providing more than just another “typical” natural hair meet-up she wants everyone to receive a full bodied experience. 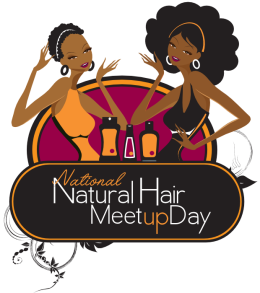 Therefore, attendees can look forward to creative events that reach beyond the standard natural hair meet-up. Some of this years events will be fashioned as social mixers with refreshments, Natural Hair fashion shows, and even an outdoor festival. You can visit INHMD and check out what exciting event will be happening near you. This year’s returning title sponsor is Koils By Nature, which is led by the amazing Pamela Jenkins. Attendees of the DMV area event will have the opportunity to meet Pamela as well as Adeea, but not to worry no one will miss out on the excitement because there will be live Tweeting and Facebooking using the hashtag #INHMD throughout the day’s events. Tickets are still on Sale but moving fast! You can purchase yours here today. Adeea has also dedicated this year’s events to a special initiative called INHMD Cares, which is a call to action that challenges participants to think outside the box and give back a small portion of what they have received as a result of being a part of INHMD. For the main initiative Adeea is asking attendees to bring one NEW Natural hair care product of their choice to be donated to either a nursing home, women’s shelter, service member overseas or extended care facility. Domineque Banks transitioned at 27 from complications due to Lupus. 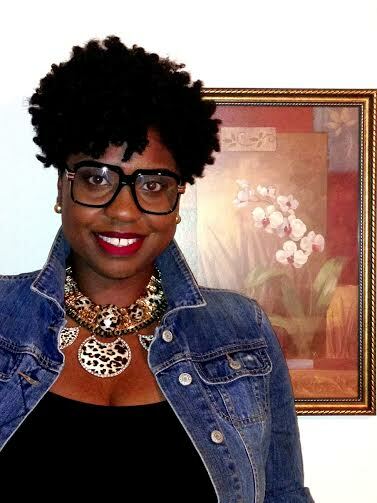 For Brown Girls Founder Karyn Washington, transitioned at 22 years of age. The second initiative is as a result of the recent passing of two amazing young women within the natural hair community. Just last month Blogger, Karyn Washington of For Brown Girls and Natural Hair Vlogger, Domineque Banks of Long Hair Don’t Care, passed away at only 22 and 27 years of age. Adeea made it her mission to raise awareness and has instructed every event host to have some sort of informational session with speakers or pamphlets on mental health, suicide prevention and lupus awareness. Enjoyed this Interview? Tell us more below. The Second Annual Women’s Expo is bringing together professional, entrepreneurial and all around phenomenal women —Walking With A Purpose— to engage in an exciting time full of networking opportunities, shopping with vendors and informative speakers. Street Intell will be providing exclusive media coverage at this event. Tickets are free and can be confirm via Eventbrite. There will be a $5.00 suggested donation accepted at the door that will go towards continuing the efforts of the organization and supporting the Dark IS Lovely mentoring program. Ladies prepare your business cards, reserve your ticket today and we will meet you at Dark IS Lovely, Inc.’s 2nd Annual Women’s Expo! 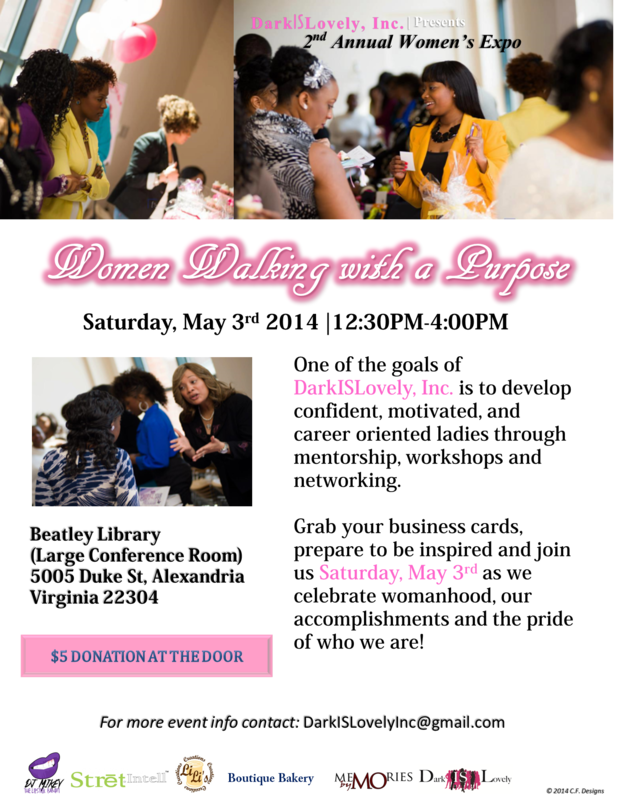 Dark is Lovely, Inc. is a non-profit organization founded by Executive Director, Adoma Adae. The vision of the brand is to encourage positive self-imagery and support young girls through mentorship, networking and workshops. The organization has been committed to the Northern, Virginia community through provided HIV/AIDs awareness workshops for the youth and a variety of other events focused on uplifting individuals. I was inspired to start this organization after my first trip back to Ghana, West Africa in 2007. While there, I met a group of women who had bleached their skin. I didn’t understand why someone would put their health at risk or permanently damage their skin to feel beautiful. After I returned, I conducted some research and discovered that many other groups of women—and men—of color, domestically and intentionally had bleached their skin for various reasons. That knowledge motivated me to launch the Dark IS Lovely movement; where I sought to bring awareness to the issues of Colorism and Self-Acceptance. Dark IS Lovely, Inc. was launched in March 2011 with the aim of making individuals aware that there is nothing wrong with having Dark skin tones and that we all should learn to accept and love who we are. My goal is to help young ladies and women understand that loving yourself is not something that can be taught, yet it’s something that is learned as you grow through life. I encourage everyone to reject the media’s definition of beauty and define their own true beauty but most importantly do not allow your skin tone to determine your worth! Timea Gaines is a leading PR and entertainment professional, enthusiastic about promoting positive people, brands and ideas. She is also the founder of the SHE Rocks Awards and Artist Showcase. As the CEO of Love Life Media she aims to bring positive Entertainment; Inspirational Pop Culture and so much more to the forefront. Timea’s idea for She ROCKS all started with the desire of putting together a short documentary for Women’s History Month. The documentary was to be directed at highlighting women working in specific fields and industries that she admired. As she researched different professions, she came across the fact that less than 30% of female visual artists across the world, do not have their artwork displayed in museums, as much as their male counterparts. Being that Gaines had a professional background in theatre, this struck a chord with her and she felt as though she wanted to do more. Gaines also took note of how many of her female friends, in the music industry, had expressed that people tended to make bias comments on their abilities. Some frequent comments they would receive were phrases like “she was killing it for a girl or you play bass real good for a girl”. 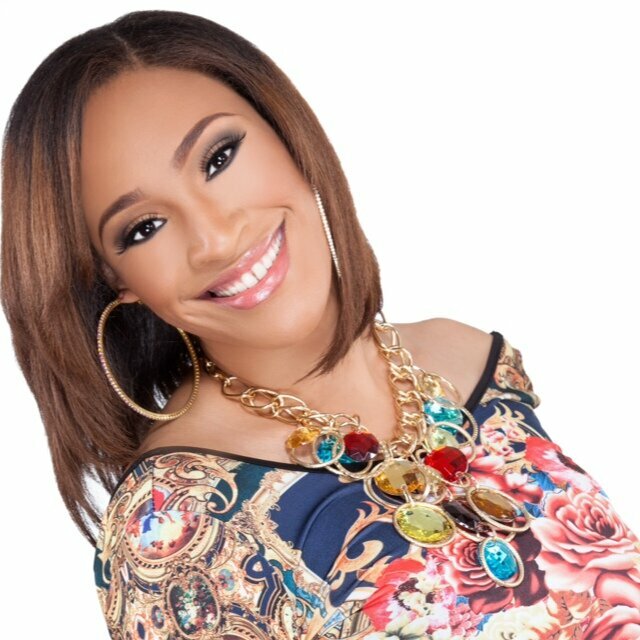 It was through this awareness that Gaines decided she wanted to create the SheROCKS event. Women’s History Month is here and it is not only a time to acknowledge and honor the contributions of our sisters, but also to celebrate, support and encourage them. That being said, we have partnered with three amazing organizations, Jaden’s Closet, Inc., Dark is Lovely, Inc., and the Boys & Girls Club of America, to take on a special initiative: Saving Our Sisters. We have teamed up to support ACTS Turning Points, a Domestic Violence Intervention Program that provides housing, food, clothing, legal and counseling services to women and children affected by domestic violence. § Men, who as children witnessed their parents’ domestic violence were twice as likely to abuse their own wives, than sons of nonviolent parents. Most women affected by domestic violence have no place to go and no one to help. If children are involved, most women will stay in an abusive relationship for fear that they have no way to provide for their children outside of the home. Street Intell is pleased to be apart of a solution to help families in need and request your help in doing the same. That sounds great! But how can I help? Join the campaign! March 10th-28th we will be collecting essential items needed to further advance the efforts of the ACTS Turning Points program. Week one focuses on providing basic supplies to our sisters arriving at the safe houses. You can purchase items to create an entire kit or purchase one item to be used in a kit. Every little bit helps. Basic Clothing Kits: (All items in Kit must be new) Designed for adults and children, male and female, from sizes small -2XL. Sizing throughout essentials package should be consistent. Colors chosen can be gender specific but neutrals are also encouraged. Week two focuses on providing food to our sisters and children currently living in safe houses. Think canned goods, water, cereal, juice, etc. ACTS Turning Points provides all the food for the women and children in the Domestic Violence Intervention Program. Food is a necessity and a TOP priority at the shelter. Week three focuses on supporting the ACTS Turning Points mission by ensuring the program has the funds needed to help the many women and children that come through their doors for assistance. The gift cards allow the program to purchase items such as food, water, clothes, medicine, first aid supplies, supplies for babies and school age children, blankets, pillows, the list goes on. Gift cards in any amount are welcome. Please note gift cards to grocery stores, Walmart, Target, Pharmacy/Drugstores like Walgreen’s, Rite Aid or CVS are greatly appreciated. How do I get the items to you? Please contact Chevonne Thomas at 571.991.9015 or thomaschevonne@gmail.com for drop off/pickup/shipping information. Feel free to reach out to info@streetintell.com or you may contact Dottie Larson, Program Director for ACTS Turning Points Domestic Violence Program. We appreciate any assistance you can provide. Thank you in advance and continue to share the Street Intell. 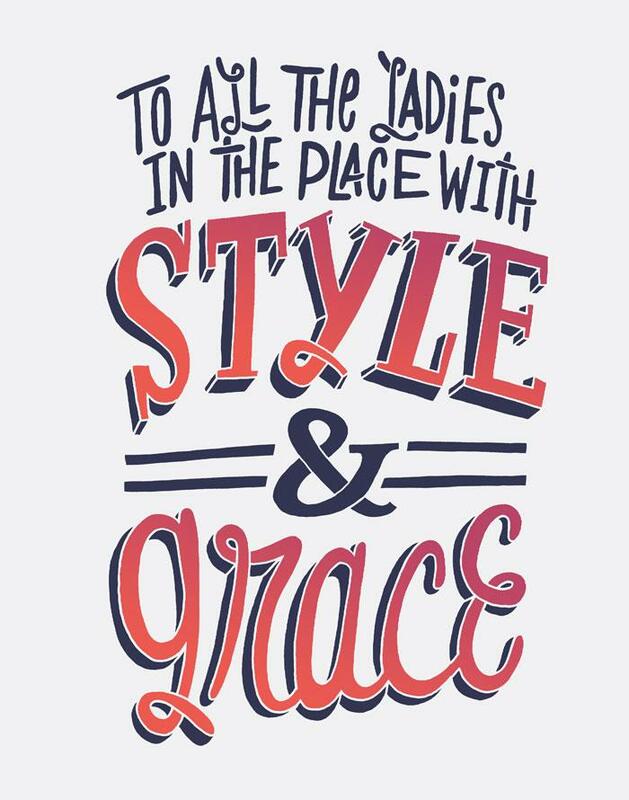 Today marks the beginning of March which is also recognized as Women’s History month. WHM is a global celebration honoring the worldwide contributions of women through out history and contemporary society. S/O to every woman living HER story and changing our world. Brooklyn based illustrator, muralist, and social entrepreneur Tatyana Fazlalizadeh, will be hosting her very first speaking engagement on March 1st at the Brooklyn Museum. 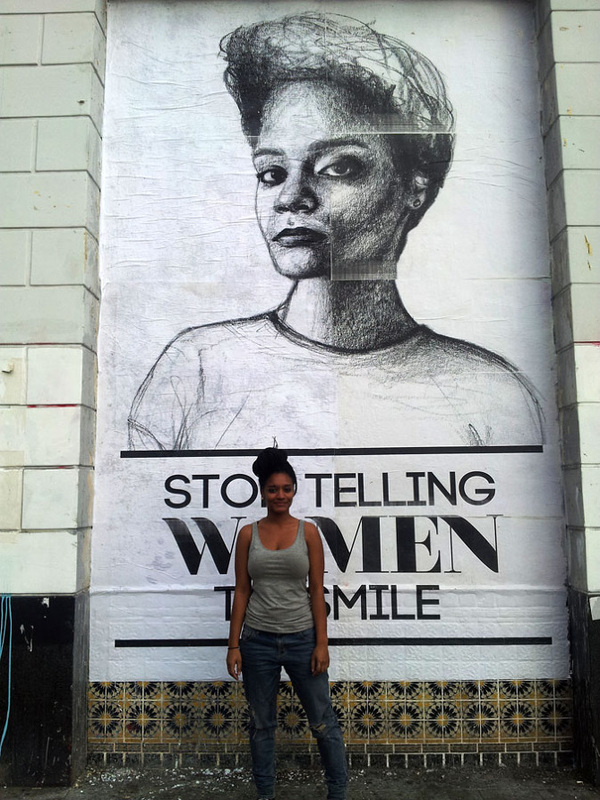 At the event Tatyana will be sharing more insight on her on going public arts project,’Stop Telling Women to Smile’. 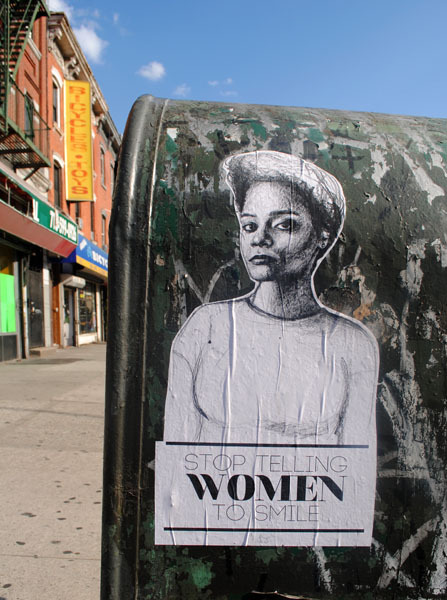 Stop Telling Women to Smile is a street art campaign that boldly addresses the issue of gender based street harassment; of which more than 80% of women (and young girls) are subject to worldwide. 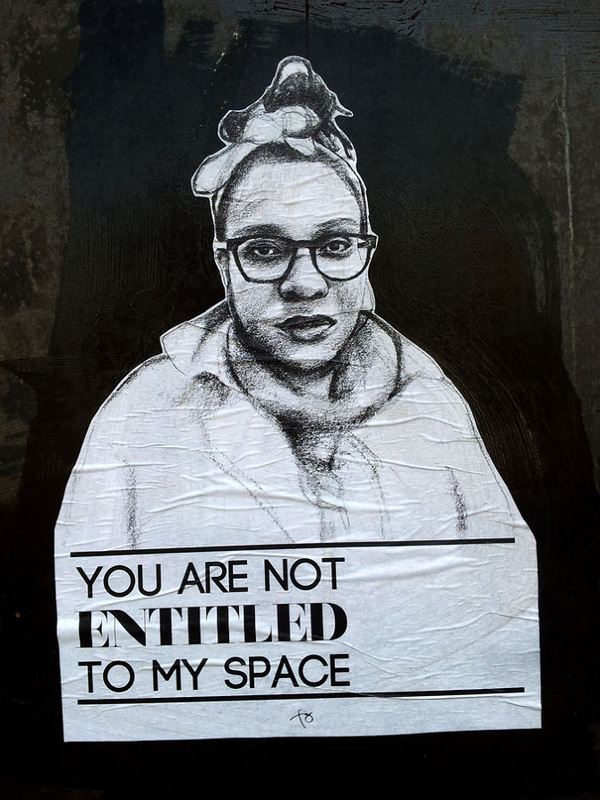 The series is composed of portrait illustrations of women that have shared their experiences of street harassment with Fazlalizadeh. Their illustrations are combined with compelling phrases like “My outfit is not an Invitation” and “Critiques on my body are not welcomed”. The portraits are then designed into posters and plastered with wheat paste all across neighborhoods in New York and various states such as Chicago and Philly. 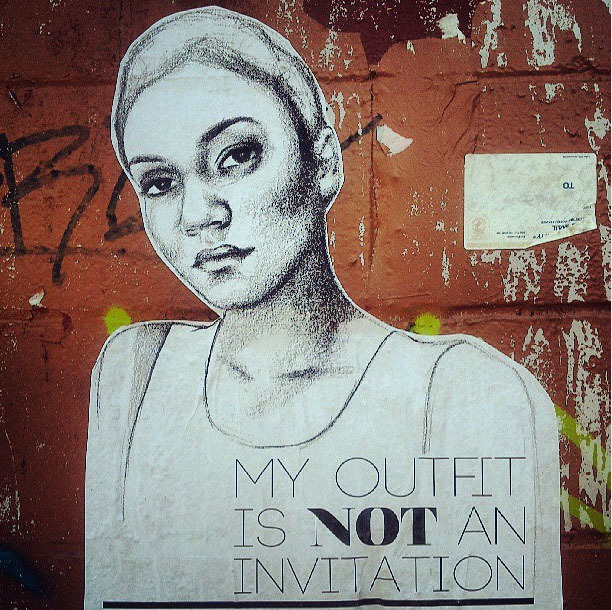 Street harassment is a serious issue that affects women world wide. This project attempts to take women’s voices, and faces, and put them in the street – creating a presence for women in an environment where women are a lot of times made to feel uncomfortable and unsafe.